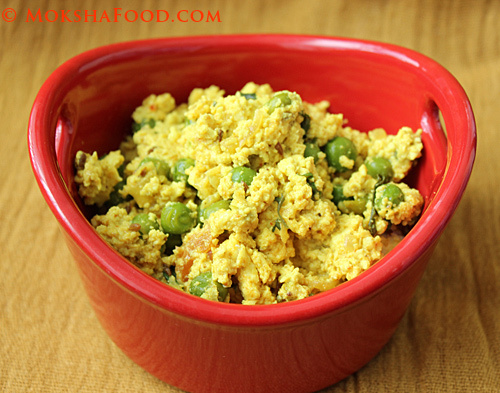 Bhurji or Scramble is a favorite and convenient method for roadside vendors in Mumbai, India. They have huge flat iron pans heating away on coal stoves. With amazing speeds they chop away all the vegetables directly into the pan. Then toss handful of spices and saute them on high heat. The speed and skill with which they cook and the synchronized noise of the banging of the metal spatula on the pan is a spectacle by itself. They serve these spiced concoctions with freshly baked bread for an easy and satisfying snack/meal. The vendors usually make it with eggs but today i made a similar recipe with paneer /cottage cheese. You can also try it with tofu. Bhurji is a very forgiving way of cooking. You can swap the vegetables or spices to change the flavor of the dish. 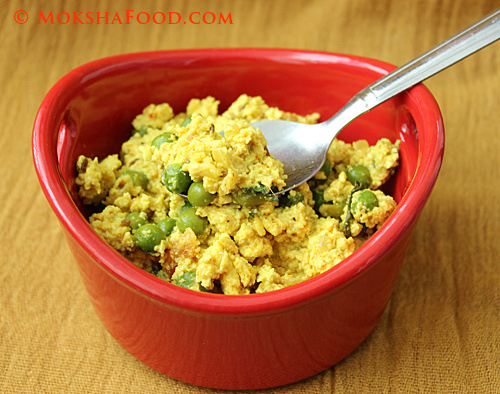 Paneer bhurji can be rolled into a breakfast burrito or as a snack as a sandwich filling or make it the star of your meal paired with bread or rice and dal. In a large saucepan, heat 1 tbsp of oil to medium. Temper with cumin seeds and let them crackle. Next goes in the ginger and garlic. Now add in the grated paneer and the green peas and mix in with the spices. Pour the milk and saute till all the milk is absorbed. Flavor with salt and taste to balance the spices. Serve with your favorite bread or flavored rice.